Each Zone-365 Bamboo Drinking Straws with Reusable Brush comes a long way before getting to your favorite glass of refreshment. Learning its background will give you an idea why these bamboos are so special. With its self-replenishing qualities, bamboo is one of the most versatile materials for just about everything without making a big impact in the environment. To make a sophisticated bamboo drinking straw, right handling and treatment is ensured at all times. Each Zone-365 Bamboo Drinking Straws with Reusable Brush comes a long way before getting to your favorite glass of refreshment. Learning its background will give you an idea why these bamboos are so special. From the rich mountains, bamboo sticks are cut and sun-dried for a few weeks to remove moisture. Once dry, each are cut to length and polished using sand to remove the rough and sharp edges of the bamboo for a flawless finish. Zone-365 Bamboo Drinking Straws to Fire Up Your Refreshments! Want to take your gathering or party to the next level? 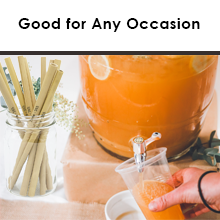 Why not host a Hawaiian or a beach-themed party and let loose your Bamboo Drinking Straws right on every hot or cold beverages. These straws will help you wrap up your party with very good compliments from guests! Feel so bored on the the standard plastic straws? Not only do they taste plastic, it is also not good for your health. 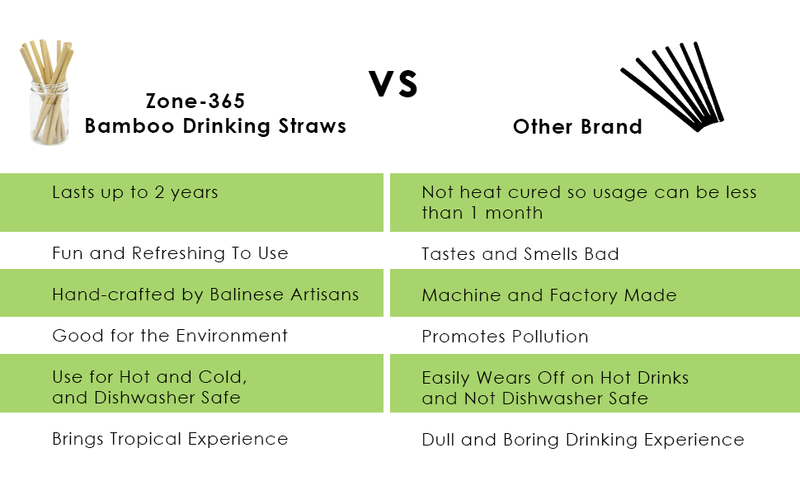 The Zone-365 Bamboo Drinking Straws with Reusable Brush are surprisingly fun to use and very refreshing without an overpowering hint of aftertaste. Try and feel it for yourself! 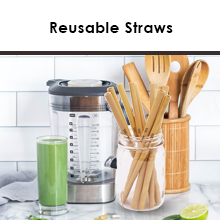 Use straws you won’t have to throw on the first use or in a day. The Zone – 365 Bamboo Drinking Straws with Reusable Brush can be used many times over a long period of time. Just wash and store correctly and you will have natural straws anytime you need one! 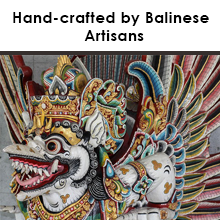 Each of the bamboo straws are hand-made by artisans in Bali, making this straws natural and a true mark of hard labor. Zone-365 Bamboo Drinking Straws with Reusable Brush offers a number of advantages. It can turn up parties into a great lasting experience and can brighten up an ordinary day. It also creates a wonderful bonding experience with family members, friends, neighbours, co-workers and more! Achieve the Tropical Feel with Every Sip! Have you gone to the tropics before or wanting to go for a relaxing getaway but have no time to do so? 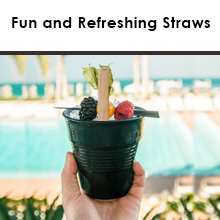 A sip from Bamboo Drinking Straws with Reusable Brush takes you on a holiday feel of the tropics with soothing sand, fresh ocean breeze and the cool shade of trees. The Bamboo Drinking Straws with Reusable Brush are actual bamboo sticks that grow from a small island in Indonesia. Each beautifully polished bamboo straw is carefully hand-picked and hand-crafted by families that are experts in the bamboo industry. The very refined finish depicts a picture of patience, dedication and the love of work. When you buy and use Zone-365 Bamboo Drinking Straws with Reusable Brush, you are helping these families in the local tribes in Bali in making their crafts heard around the world while promoting green friendly products as a sustainable solution. By patronizing these bamboo straws, you are actually helping the families send their kids to school and bring high morale and dignity for their decent job. When I originally got these bamboo straws I was worried that even though they were marked as were reusable that they might be flimsy and only last for a couple uses. However, I was pleasantly surprised to be wrong. The straws are very sturdy. I have been holding up very well even after multiple uses and they look as if they are in the same condition as they were when I bought them. I really like that they came with a cleaner brush as that made it so much easier to clean them. I got this item for free or at a discount for only my honest and unbiased review. I really like these straws. You will notice that all the straws are not identical, as these are handmade, so each one will vary ever so slightly in size and length. These straws didn’t have any kind of taste to them but it does feel a little different than drinking from a plastic straw, as they have a more hollow feel to them. I do not like the “Zone 365” imprint on them, but I can live with it. You get ten straws in an order, which is great! These straws were skinnier than I had expected, and I love it! They aren’t quite skinny enough to fit into my tumbler cup lids, but they aren’t bulky or awkward. I dine out a lot and tend to pass on the disposable straw. These are durable enough to keep in my purse and classy enough to use them in store. They also come with a cleaning tool which makes for extremely easy cleaning! I’ve used quite a few different types of reusable straws before and these are my favorite. They’re a little softer then stainless steel, but hold up better than silicone or plastic. They’re very well made and can be cleaned in the diswasher, which is a real surprise. The included brush is perfect to clean out the inside of the straws. Overall, I really like these straws and have been using them often. I recieved these straws for free in consideration for my unbiased review; all opinions are my own. These bamboo straws are made so much stronger than plastic ones. They are so easy to clean with the brush that is provided with your purchase. I live in an area with an encroaching plastic straw ban, so I’ve been on the lookout for more reusable straws for my kids. I really like these bamboo ones because they are sturdier than the reusable plastic straws, but unlike the steel or quartz straws, these won’t damage teeth if they bite down. I also love that they came with a cleaning brush, all straws should!